Posted November 22, 2009 by Emmet Farrell in News. 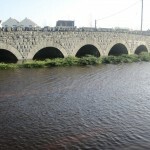 We posted some images yesterday of the floods in Claregalway and surrounding areas. 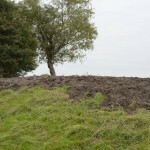 We now have some more photos from around the area, taken today the 22nd of November 2009. The water has risen considerably in the last number of days, and some estates have been evacuated. 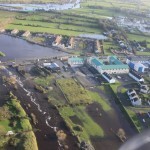 For up-to-date information on the floods in Claregalway, and all over Galway, tune in to Galway Bay FM (95.8 FM). For weather updates check out Met Éireann. As Claregalway has been devastated by floods, emergency accommodation has been set up in local hotels. These rooms are for victims worst effected by the floods, and those who cannot return to their homes. Electricity in some homes has been cut off to reduce the danger of electric shock. It is thought that some residents won’t be able to return to their homes for several weeks as water systems will remain flooded. 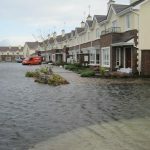 Flooding has since stopped in Claregalway and many local residents have written to us asking us to express thanks to all those who volunteered during the disaster. As you can see from the photos below, many locals helped out during the floods, filling and dropping sandbags, and providing shelter and food for those who were unable to return to their homes.